The course is divided into 10 equal sections by 11 control gates on each side of the course. Can you state at least one-way judges use control gates for evaluating an athlete’s run? Each turn judge has 20 points to evaluate the athlete and each control gate section is 1/10th of the course. With some simple math: 20/10 = 2, therefore each section of the course is worth 2 points. 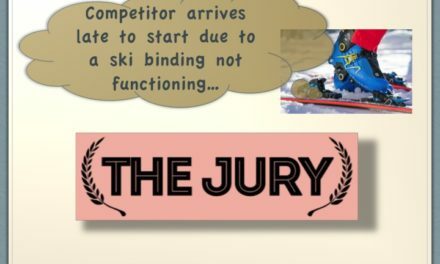 The turn judges using Rule 6204.1.3 can deduct “2.0 for each section a competitor has complete loss of control or does not ski.” In rule section 6204.4.1, Deduction of Turn Score lists several possible errors that could occur during a run and these have points assigned to them. So judges are not throwing out random numbers when they observe an error. 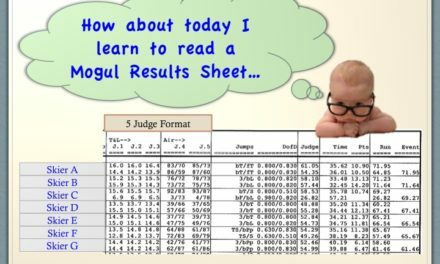 Next time you look at the results sheet, there are 2 numbers listed for each turn judge – one is your base score for your turns and the other number is the deductions (some result hand-outs may not contain these details, but you can ask for them or see your score cards). 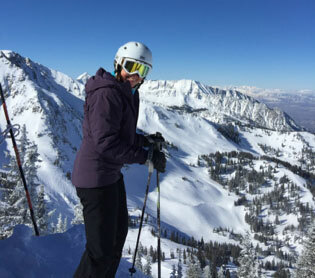 An example is a skier falls, slides the distance of 2 control gates, gets back up and continues her run. How many points are deducted due to course not skied? The skier also fell and a complete fall without stopping can receive a deduction of 4.1 to 5.9 points. So the skier will receive a deduction between 8.1 to 9.9 points. This example also illustrates how judges’ scores will vary because most deductions have a range not a specific value. Skiing around a control gate and back into the course is a DNF (did not finish). 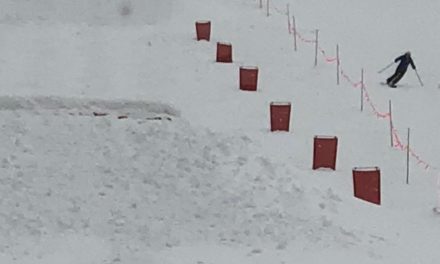 Imagine a skier is making his way down the course and suddenly gets thrown out of course just above a control gate. His momentum brings him around the gate and then he continues back into the course to continue his run. This is a DNF. The skier received a zero for the run. 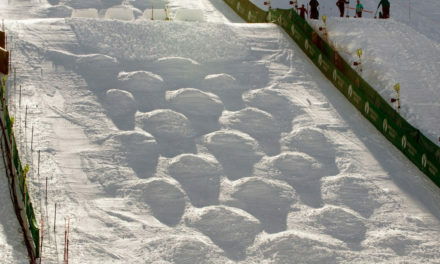 Now imagine a skier making his way down the course and suddenly gets thrown out of course just below a control gate. He makes his way back into the course to continue his run. 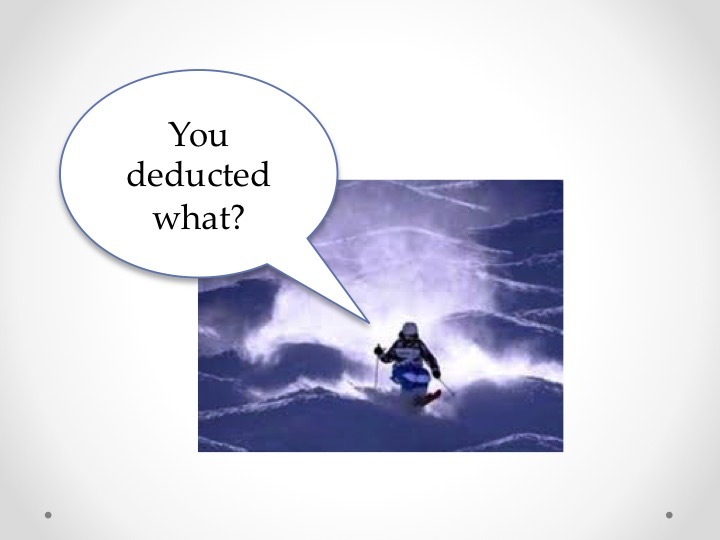 This skier received a change in fall line deduction of 1.6 and depending on the length of the course not skied – let’s say it was about a third of the control gate section – he received another deduction of 0.7. The skier made no other errors so his total deduction score was 2.3 from one turn judge. The other 2 turn judges may give more than 2.3 or less than 2.3, depending on their interpretation of length of the course not skied. Let’s say the total deduction score from the 3 turn judges was 6.9 (2.3 + 2.2 + 2.4) and his base score was 16 on average from the 3 judges. The total turn score is calculated from the base score from the 3 turn judges, which was 48 (out of a possible 60 points as turns is 60% of the 100 possible points) minus 6.9 = 41.1. Next time you look at the results sheet, see if your run had a deduction score and see where you would have placed if your run had no errors!